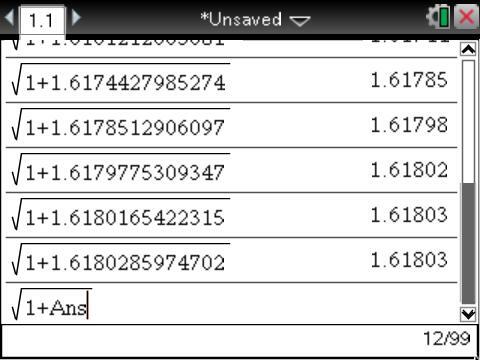 The following is from the AP Statistics EDG. Click here to access the original 10.30.11 post. George Cobb … posted … on how statistics differs from mathematics and how that impacts the teaching of statistics by mathematics teachers. It was a great note but I felt that the “bad guy” was perhaps not entirely mathematics but the way in which mathematics has often been taught. While everyone the world over gets the same answer to a long division problem, if you look at other cultures and other times, you will find that the algorithms used have varied widely. Each has it’s justification, but those are rarely taught to children. This is why I refused to learn it in fourth grade;-) While some lament the substitution of an electronic device for the hallowed algorithm of their youth, both that algorithm and the plastic calculator are cultural artifacts that come and go while mathematical truth remains. In graduate level mathematics, definitions are chosen for a reason, though again that is rarely shared with the learner. What are the pros and cons and historical roots of the definitions of “real number” given by Cantor and Dedekind? So George’s comments made me think of a quote from another of my mentors that used to hang on my office door. It’s taken me this long to find it on an old Windows backup and move it to my Linux computer. Robert B. Davis was an MIT-trained mathematician who gave up research to work with inner city children. The paragraphs below I assembled from a variety of his writings over the years — most of them never widely available. “Whereas science and creative mathematics are essentially and necessarily tentative, uncertain and open-ended, the traditions of elementary school teaching in many instances are authoritative, definite, absolute, and certain. Such a view is incompatible with science, with mathematics — or, for that matter, with nearly any serious body of thought. In fact many questions have no answer, some questions have many (equally good) answers, and some questions have approximate answers but no perfect answers. The “tolerance of ambiguity” that is required of anyone who would see the world realistically is a severe demand for some teachers. One reason to learn and teach statistics is so we can become better mathematics teachers. Given the coordinates of only two points of your choosing from an unknown polynomial, could you guess the exact equation of that polynomial? The problem as originally stated is here and a few different explanations are here. For the computations, I think the use of technology is a no-brainer. I love seeing the different ways students think about solving problems. Many of my classes involve students analyzing the pros and cons of different approaches. As an example, a recent question on my first trigonometry test in my precalculus class asked students to find all exact solutions to in the interval . Admittedly, this is not a complicated problem, but after grading several standard approaches to a solution, one student’s answer (Method 3 below) provided a neat thinking alternative. Specifically identify the error(s) you made on the problem. Provide a correct solution to the problem. My students usually take their tests on their own, but after they are returned, they are encouraged to reference any sources they want (classmates, notes, me, the Web, anyone or anything …) to address the two requirements of test corrections. The point is for my students to learn from their misunderstandings using any source (or sources) that work for them. Because students are supposed to do self-assessments, I intentionally don’t provide lots of detail on my initial evaluation of their work. To show their different approaches, I’ve included the solutions of three students. Complete solutions are shown so that you can see the initial feedback I offer. 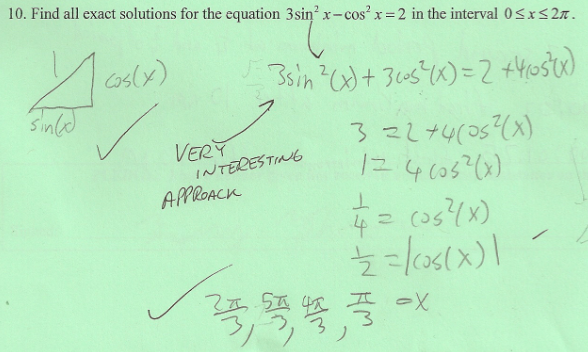 If there’s interest, I’m happy to provide examples of student test corrections in a future post. This solution started well, but she had an algebra error and an angle identification problem. Method 2: Elimination–The same Pythagorean identity could be added or subtracted from the given equation. After talking yesterday with the student who created this particular solution, I was told that he initially completed the left column and attempted the work in the right column as a check at the end of the period. After committing the same algebra error as the student in method one, he realized at the end of the test that something was amiss when the cosine approach provided an answer different from the two he initially found using the sine approach. After conversations with classmates yesterday, he caught his algebra error and found the missing answer. He also corrected the units issue. Method 3: Creation–This approach was used by only one student in the class and uses the same Pythagorean identity. The difference here is that he initially moved the term to the other side and then added an additional to both sides to create a 3 on the left using the identity. Nothing like this had been discussed in class, and I was quite interested to learn that the student wasn’t even sure his approach was valid. What I particularly liked was that this student created an expression in his solution rather than eliminating expressions given in the initial equation as every other student in the class had done. It reflected a mantra I often repeat in class: If you don’t like the form of a problem (or want a different form), change it! Also notice how he used an absolute value in the penultimate line rather than the more common . Again, nothing especially deep about any of these, but I learn so much from watching how students solve problems. Hopefully they gain at least as much from each other when comparing each others solutions during corrections.